WELCOME ALL KIDSPORTS FAMILIES to the AUTZEN Stadium WEEKEND!!!!! Parking is free. All vehicles must enter the East parking lot through Entry 5 on Leo Harris Parkway. Parking will only be in the EAST PARKING LOT. Vehicles parked in any other areas, including the Moshofsky Center, will be subject to being towed. PLEASE, park only in the designated parking areas. VIEW MAP HERE! 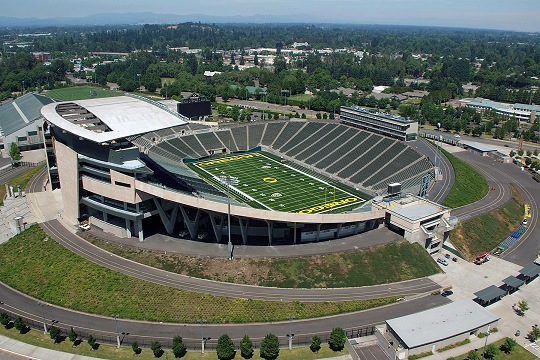 ALL players, coaches, and spectators must enter through the East Gate of Autzen only. There is no charge for entrance into the stadium. Please clean up your seating area before leaving the stands - and place all garbage in the garbage receptacles. All spectators will be directed up the East ramp on the South side of the stadium to the seating area. Seating will only be on the South side of the stadium in the designated seating area. Anyone roaming outside of the designated areas will be asked to leave the stadium. Only players and registered coaches with their 2018 KIDSPORTS Coach ID BADGE will be allowed on the field, and in the warm up area. Teams warm up area is located outside the East entrance. All players and coaches will enter the playing field area through the EAST tunnels. Only water is allowed on the playing field. Sports drinks and coffee are not allowed on the field. COACHES: Kidsports will supply the chains and down marker so please do not bring yours. Home team will be responsible for running the chains and they must be run on the North Sideline. Only 3 people will be allowed on the field as the chain crew. COACHES: Prior to the start of each game we will announce each player's name and uniform number. As they are being announced please have the kids run from the sideline to the middle of the field and line up facing the South stands where all the spectators will be seated. Roaring Rapids Pizza will be selling food and Pepsi products during the games. KIDSPORTS will also have programs for sale. KIDSPORTS cannot express strongly enough how important good sportsmanship is at all times, but in particular when playing as guests in Autzen Stadium. KIDSPORTS will not hesitate to remove spectators, coaches or players from the stadium. GOOD LUCK - PLAY SAFE and HAVE FUN!! !